I am a psychotherapist and will probably use a variety of approaches in our sessions, although generally wouldn't mix approaches in an individual session. 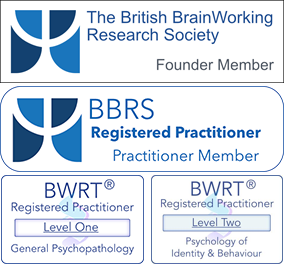 BWRT® stands for BrainWorking Recursive Therapy®, a model of psychology and psychotherapy created by UK professional therapist, Terence Watts, MCGI. It's a totally confidential method that does not require you to reveal your private information or personal secrets to your therapist and it is carried out in a completely conscious state. It does not use hypnosis or any concepts that might be considered mystical or unscientific - it's completely logical, practical and down-to-earth, and for it to succeed only needs you to know what you want to change in your life. Only Certified Practitioners have been trained to deliver BWRT® and all have to adhere to a strict ethical code. Perhaps most importantly, BWRT® is a comparatively fast therapy, and, depending on the presenting issue, can often be resolved in only a few sessions. It is also a very private therapy - I will only require a minimal amount of information from you and, unlike some other forms of therapy, you will not have to extensively relive unsettling past experiences. You will not have to tell me what you are thinking or share any intimate personal details that you feel uncomfortable about. Find out more at our dedicated BWRT® website at BWRT® Yorkshire. Training courses usually take place over a short timeframe and are designed to help you develop and explore new skills. Training could be a half-day or full day course, take place over a couple of days, or one day a week for several weeks, depending on the subject. Training courses are suitable for private individuals, groups and for businesses. Most of my training is based on the idea of personal development and the themes of how to change ourselves for the better, how to improve communication, developing a better understanding of ourselves and others, and developing inter-personal skills such as assertiveness, anger management, and similar. Please view the training courses page for full details.